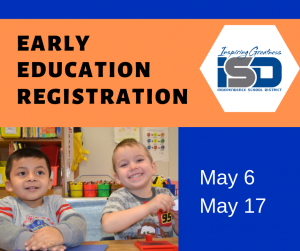 If you are new to Early Education in the ISD and enrolling for the first time, registration for children ages 3 and 4 will take place May 6 and 17 at ISD Central Office located at 201 North Forest Avenue. To make an appointment for your child, please call 816-521-5314. You will need to bring two proofs of residency (utility bill, mortgage or rental agreement) as well as your child’s birth certificate and immunization records to the registration appointment. For those currently enrolled in ISD Early Education, we will begin reenrollment for the 2019-2020 school year, in March. Our Early Education Family School Liaisons will be contacting you to update paperwork and ensure your child’s placement in our programs for the next school year. The Independence School District has one of the largest Early Education programs in Missouri, currently serving more than 850 children. In 2019-2020, we will add two sites and six classrooms to be able to serve more than 1,000 students. We look forward to expanding opportunities for students and families. We proudly staff highly trained and credentialed teachers and follow a daily routine in all classrooms designed to provide opportunities for children to function as planners, decision-makers and problem-solvers. Our learners participate in art, writing, math, science and computers in preparation for kindergarten. We look forward to welcoming new and returning students to our Early Education programs in the ISD.